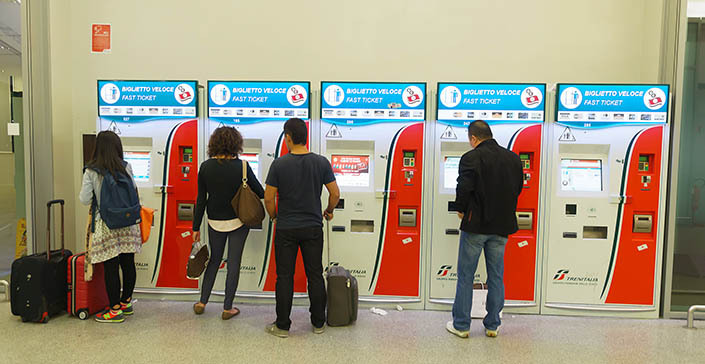 The use of self-service kiosks is on the rise. Industry segments such as transportation – airlines ticketing, government – US custom, banking – teller machines, or retail stores—have begun to utilize in-store kiosks. The self-service industry of the current decade recognizes that “automated or semi automated kiosks” are about to play a key role in the customer-service journey across retail industry segments. According to June 2015 report by Allied Market Research titled, “Global Self-Service Technology Market (ATM Machines, Kiosk Machines, Vending Machines and Geography) – Size, Share, Industry Analysis Trends, Opportunities Growth Segmentation and Forecast, 2014 – 2020“, the ”in-store kiosk” segment is the fastest growing in store retailing tool. Even if human engagement is needed throughout the retail experience, in store kiosk is a very helpful tool within the self-service market. The article also points out that the global self-service technology market would garner $31.75 billion by 2020, registering a CAGR of 13.98% during the forecast period 2015 – 2020. Currently, the largest consumer of self-service kiosks is the retail industry, taking 30% of the total market share of kiosk business. The success of this self-service technology market is mainly driven by large companies’ need to offer more convenient services to the customers, while at the same time optimizing the cost of such services. Therefore, enterprises operating in sectors such as retail, healthcare, food, and banking would be the drivers of such demand. Most tech-savvy customers prefer being in charge of electronic transactions, via their PC or mobile device. This is also true when a consumer is trying to make a transaction in a kiosk. In a case where issues or questions arise during their transaction, the ability to interact with an agent in person is a helpful tool. Today’s digital customers want to enjoy the freedom of choice as it pertains to information delivery mode, whether be it the mobile or PC station at home or at an on premise kiosk. Therefore, retailers have to ensure the technologies that they enable multi-channel delivery in their business support. Additionally, self-service kiosks must support information delivery through many channels. This helps the customers to retrieve the necessary information from every channel in an easy and a timely manner. Enable reduced store queuing (depending on number of kiosks and remote support agents). The ability of kiosks to help process transactions can help predict demand and thus provide better customer service. Self-service kiosks with niche focus can help with remote customer service where few trained service experts can serve several customers regardless of their geographical location. This approach not only increases efficiency and reduces staffing costs, but also ensures that service quality is highly monitored through the trained experts. Kiosks provide a highly flexible platform for combining assisted self-service with fully automated service. When retailers use live assistance within their kiosk applications, they experience higher customer engagements and higher levels of satisfaction. As the interest in assisted self service kiosks continues to grow among the retail healthcare, food, and banking industries and among customers of all ages, technologies like VeriShow’s multi-channeled platforms designed for kiosks will become a prominent part of this growing industry.. Integrated systems like VeriShow offer the many benefits to both vendors and users especially when guided support throughout the customer-service journey is needed.